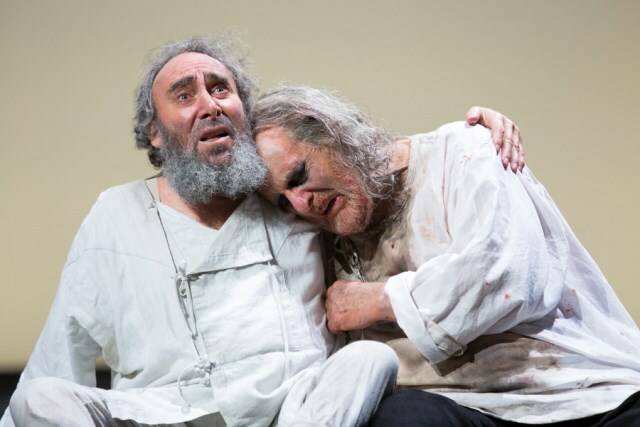 When I caught actor Antony Sher speaking at the Cheltenham Literary Festival last year, he was already emphatic about playing Lear following on from his sublime turn as Falstaff in the RSC's Henry IV Parts I and II. Seeing his enthusiasm sent tingles down the spine at the potential of this forthcoming Royal Shakespeare Company (RSC) production. 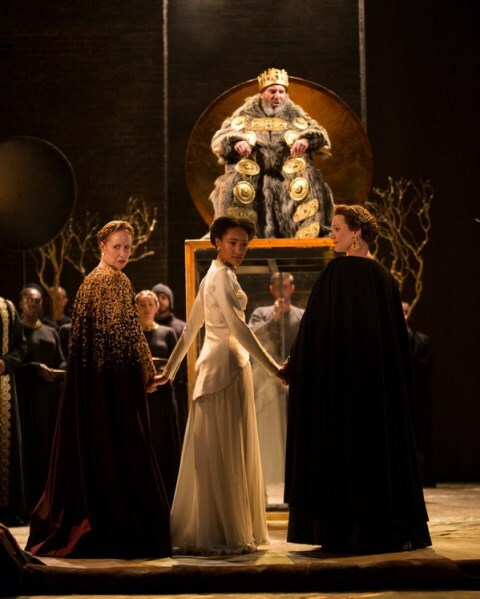 That anticipation doubled due to Lear also being directed by Gregory Doran, the RSC's artistic director and the man with the golden touch when it comes to re-imagining Shakespeare for a 21st Century audience. King Lear has now opened at the Royal Shakespeare Theatre in Stratford upon Avon where it remains until October 15 before transferring to London's Barbican Theatre from November 10 to December 23. Sher, a leading actor of his generation, takes on the mantle of the misguided king who lives to regret giving away his kingdom and title to his two unworthy daughters while disowning his worthier child. He's progressed to the lead role since starring in Lear for the RSC at the same theatre back in 1982, when he played the Fool to Michael Gambon's King. Visually, Lear's fall from grace into madness is beautifully displayed with Doran concentrating on a dramatic physical change from the regal pot-bellied figure covered in furs and carried in on a sedan chair in the opening scene to the fragile, gaunt figure wandering around a beach in his latter moments. Early on, the all-powerful Lear seems able to summon up the thunder like a celestial spirit in ancient Britain to accompany his rulings but this is turned on its head in later scenes when his attempts to do the same are played down by his dismissive offspring. What is often lost in many productions are the comedic lines in Shakespeare's tragic tale of betrayal but Doran has worked hard to emphasise this and is helped by the twinkle in Sher's eye. He excels at showing Lear as a split personality, raging at one moment and begging endearment the next. While Sher has magnetism on stage, he is matched by the trio in a subplot of another dysfunctional father and child relationship - that of the Earl of Gloucester and his sons, Edmund and Edgar. Pappa Essiedu, who shone as Hamlet at the RSC earlier this year, shows he is just as good at breaking bad with this latest role as the evil illegitimate son, Edmund. There's still some of the sarcasm and sulkiness he displayed as Hamlet but also a heavy undercurrent of nastiness. Playing his wronged half-brother, Edgar, is Oliver Johnstone, who can also be seen in this season's Cymbeline. Johnstone's scenes with his father, Gloucester (David Troughton), are particularly touching with heavy doses of sentiment. In contrast, the infamous bloody eye-gouging torture scene is clinical yet chilling with Gloucester dragged into a glass cube on stage that catches sprays of blood from his mutilation. To bring out the full gore, the Duke of Cornwall then smears the glass with his bloody hand; a nice touch that draws squirms from the audience. Kelly Williams is gloriously nasty as middle-daughter Regan and is clearly the most sinister of the "baddies", making you even feel some sympathy for her nasty husband, the Duke of Cornwall (James Clyde). Williams is part of a well chosen, excellent cast that features some of the most impressive rising talent of the moment, like Essiedu, Johnstone and Natalie Simpson as Cordelia, alongside experienced safe hands that are still a joy to watch. 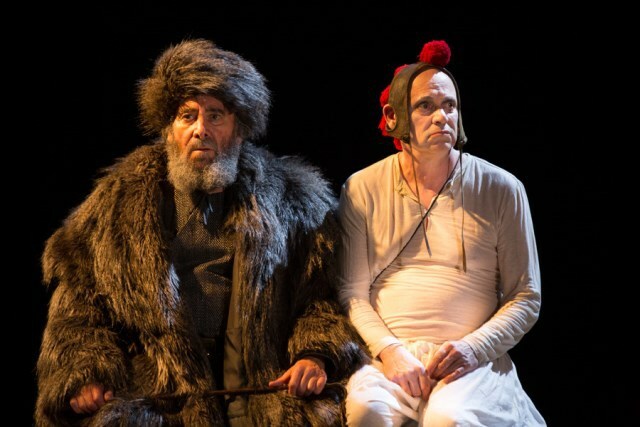 Graham Turner's Fool seems more wise and caring towards Lear than others I have seen, while Antony Byrne stands out as the Earl of Kent, watching over Lear under disguise. His transformation from long-haired lord to tattooed, shaven-heaved soldier at arms with a Newcastle twang is another way that Doran has merged Ancient Britain with a touch of modernity that features throughout this production. 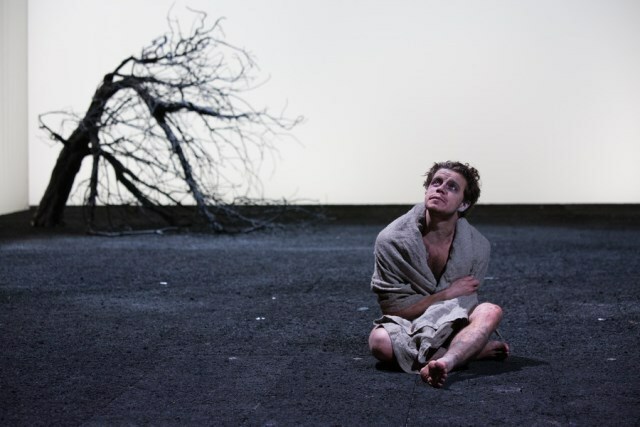 This latest King Lear is a very stylised production that offers a distinctive, fresh version of a classic tale. It's another triumph for Doran at the RSC. Tickets from the RSC website. Tickets from the Barbican website.